The great classic reaction game is back in a new compact and elegant format! The Zababa circus is looking for its new trainer, but only the most agile among you will earn a place under the famous Big Top... All on stage! This is a simultaneous puzzle solving game. 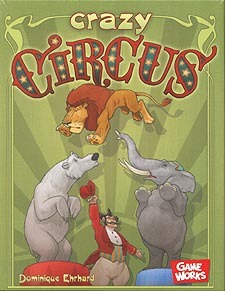 Three animals stand on two platforms, you have to to change their positions to match the top card. To do this you shout commands which move the animals to different positions, eg: "Ma", moves the bottom animal on one platform to the top, or "Ni" which swaps the top two animals on the two platforms. The first player to shout the correct command wins the card, the player with the most cards wins the game.